Series 3530 The new standard in close-coupled general service pumps. The all new stainless steel Series 3530 pump is available in 1", 1-1/4 and 1-1/2 sizes. 1/2 HP through 5 HP at 3500 RPM. Flows to 170 GPM and heads to 155 feet. 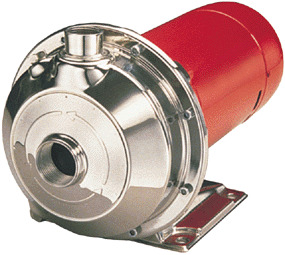 The Series 3530 is an excellent all-purpose pump. Close-coupled 316L stainless steel wet end, diffuser design for increased bearing and mechanical seal life, permanently greased, jet pump motor and Bell & Gossetts internally flushed Viton/carbon-silicon carbide seal provide an optimum worry-free pump design to 225F. Optional EPR/carbon-silicon carbide is rated to 250F. Maximum pressure is 125 psig. HYDRONIC HEATING AND COOLING SYSTEMS, GENERAL SERVICE, REFRIGERATION AND COOLING TOWERS. When you need it Today ! - OVERNIGHT SHIPPING AVAILABLE - Pump Express delivers Bell & Gossett pumps and pump parts to your door ! We have B&G and hard to find replacement parts for sale. You will pay less by ordering direct from our Bell & Gossett distribution warehouse, eliminating the middleman in the supply chain. For help selecting the right B&G pump and pump replacement parts speak with one of our Bell & Gossett pump representitives today ! Call Toll Free - 1-800-298-4100.